DENVER — A winter storm will bring snow to much of Colorado this weekend with winter storm watches and warnings already in effect; mountain roads are likely to see increasing numbers of closures into Sunday morning. In Denver and along the I-25 corridor, between 3 and 8 inches of snow is currently forecast through Sunday, with 6 to 12 inches forecast in the foothills. Highs will only be in the teens on Sunday, with lows Sunday night dipping near 0 degrees. Mountain temperatures will be similar, with winds in the 10 to 20 mph range that could gust to up to 50 mph in some places. 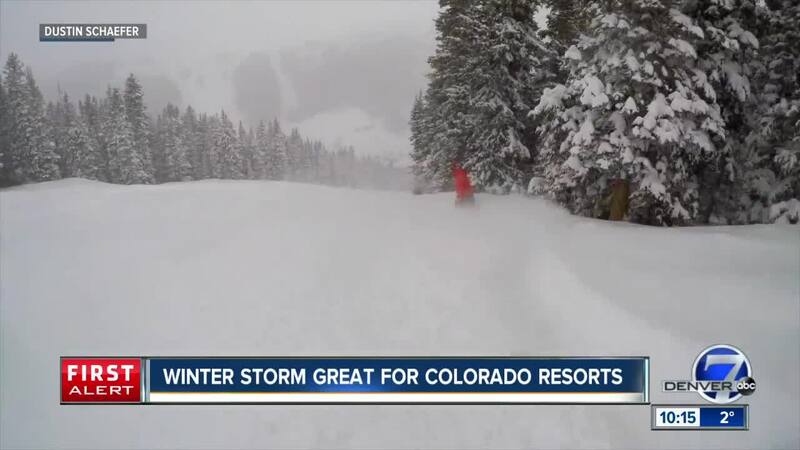 Below you can find live updates on weather and traffic conditions, along with photos and videos of the storm as it moves through the mountains over the weekend. 10:10 p.m.: Watch in the video player above for the latest forecast heading into Monday morning. We'll be monitoring any closures or delays into the morning here. 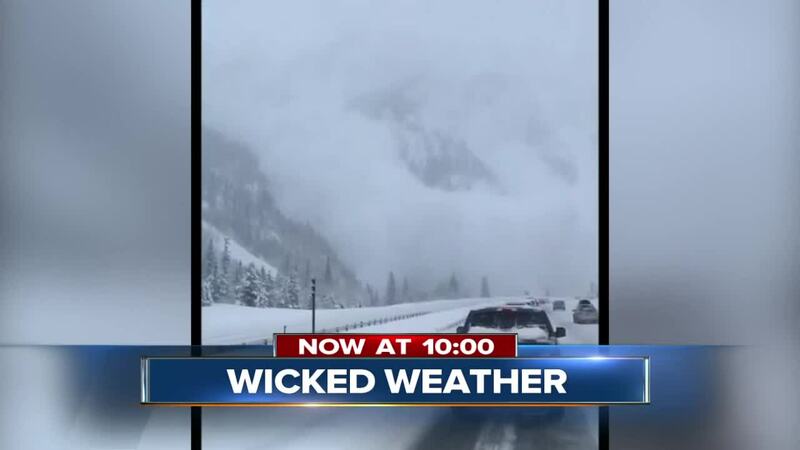 9:54 p.m.: Here's a look at the avalanche that temporarily shut down I-70 late this afternoon. 6 p.m.: A Colorado State Patrol spokesman confirms to Denver7 there are no people trapped or injured following two avalanches in Eagle and Summit counties. More on that story here. 5:55 p.m.: I-70 is now closed from Edwards to Frisco due to avalanche risk and adverse weather conditions. on the mountain corridor, CDOT says. No estimated time of reopening. I-70 NOW CLOSED FROM EDWARDS TO FRISCO. Avalanche risk & adverse road and weather conditions on the Mt Corridor. Teams are assessing now. NO ETO. Check https://t.co/uOU0HHtweG and social media posts for up-to-date information. 5:04 p.m: EB I-70 is closed at Vail due a secondary avalanche in Summity County, CSP Eagle says. WB I-70 is closed at Frisco. 5:01 p.m: I-70 is closed between Frisco and Copper Mountain due to an avalanche. CSP - Eagle officials say there are reports of people trapped in the debris at mile marker 197. We're working to learn more. 4:25 p.m.: US 40 is closed in both directions between Robins Roost and mile marker 249, according to CDOT. 4:08 p.m.: Loveland Pass is closed due to adverse conditions, CDOT says. 3:13 p.m: EB I-70 is closed at Silverthorne due to multiple spun out vehicles, CDOT says. I-70 mountain travel is discouraged due to adverse driving conditions and reduced visibility. 1:15 p.m.: Denver's official snowfall from this winter storm stands at 3.7 inches, according to the National Weather Service in Boulder. 11:32 a.m.: If you're planning on coming back from the mountains, be aware there's a 2-hour travel time between mile marker 205 and the Golden exit. 11:15 a.m.: CDOT says hazmat teams are staging between mile marker 213 and mile market 215 (west of the Eisenhower Tunnel). Travelers must use US 6 Loveland Pass if they want to get through the area. I-70 EB/WB: Hazmat staging between MM 213 and MM 215. Loveland Pass Open with CMV Chain Law & Passenger Traction Law in place. Hazardous materials must use US 6 Loveland Pass. 10:45 a.m.: There's a safety closure on I-70 near Silverthorne, CDOT says. You're advised to take US 6 Loveland Pass as a detour. I-70: Safety closure at MM 215. No estimated time to open. 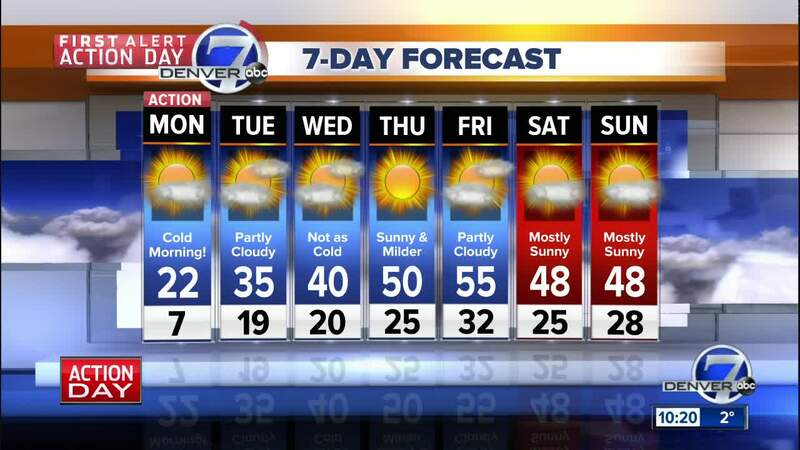 8:56 a.m.: The National Weather Service says this is the coldest March morning that Denver has seen since 1960. 8:51 a.m.: We have updated snow totals this morning here. Meteorologist Stacey Donaldson has the latest on the near-zero temperatures and wind chill in an update you can watch below. 7:35 a.m.: Bundle up! Wind chill factor will make it feel well below zero degrees. 7:15 a.m.: First Alert Action Day continues with very cold temps and wind chill. 7:10 a.m.: Expect low lane visibility across Denver roadways. 7:00 a.m.: A look at a snowpacked Hampden Ave.
10:30 p.m.: A check of road conditions across the metro. 9:55 p.m.: Driver okay after his truck falls onto an icy Clear Creek west of Denver. 9:40 p.m.: I-70 Westbound closure near Eisenhower Tunnel. 8:47 p.m.: Update on the latest snow totals across Colorado. 8:39 p.m.: Snow heavy at times overnight. Here's the temperature forecast. 8:15 p.m.: A check of conditions at I-70 at Colorado. 7:42 p.m.: Denver police say the city is on accident alert. Here's what to do if in an accident. 7:16 p.m.: City of Arvada officials say they have 15 snowplows out servicing routes. 6:27 p.m.: Steady to light moderate snow is falling along the southern I-25 corridor through at least 7 p.m., the NWS in Pueblo says. 6:06 p.m.: Denver police reports there have been 20 crashes in the span of an hour. Please drive carefully if you must go out this evening. If you have no business outside, please stay home. 5:39 p.m.: All of Arapahoe County is on accident alert. 5:17 p.m.: Lanes are hard to see right now in downtown Denver, according to Denver7's Tomas Hoppough. 5:27 p.m.: CSP Limon officials say covering multiple crashes east of Deertrail on I-70 as freezing rain has changed to snow east of Aurora. 5:09 p.m.: The City and County of Broomfield is now on accident alert. 5:06 p.m.: The Kiowa Fire District is reminding drivers to drive with caution as roads are extremily slick. 4:56 p.m.: City of Fort Collins officials say plow trucks are plowing arterial roads. 4:55 p.m.: Colorado Springs is now on accident alert. 4:30 p.m.: The CIty of Fort Collins is now on accident alert. 3:29 p.m.: The City of Aurora has deployed 42 plows and takers that are pre-treating bridges and other "known areas of concern," city officials say. 2:19 p.m.: The City of Aurora is on accident alert. 12:17 p.m.: CDOT officials say crews pre-treated major roads in advance of the snowstorm coming our way. They advise that drivers get appropriate tires for the weather and to take it slow. 12:08 p.m.: A look at the second band of snow that will soon be arriving to Denver and the I-25 corridor, from the National Weather Service. 11:15 a.m.: The lower elevations of Larimer County have been upgraded to a Winter Storm Warning thru 9 p.m. tonight. The lower elevations of Larimer County upgraded to a Winter Storm Warning thru 9pm tonight. The second & stronger portion of this storm system will arrive this aftn w/heavy snow in the Mtns along w/steady snow across the plains. 9:41 a.m.: Things have cleared up between Loveland and Ft. Collins, but Denver7's Meghan Lopez saw several cars on the side of the road this morning. 9:28 a.m.: Larimer county is finally getting some needed moisture w/this storm. Foothill areas have received from 6"-12" so far w/3"-5" in the urban areas, NWS Boulder says. 8:16 a.m.: Rocky Mountain National Park reports Bear Lake already has 46" of snow at the base. Winter Storm in the park. Winter Driving conditions 4WD/AWD recommended for traveling on park roads. Bear Lake has 46” base snow. Bear Lake parking lot has 8-10” of snow. Plows are out. 7:39 a.m.: Denver7's Meghan Lopez spotted a crash near Loveland. 7:14 a.m.: About 3 inches of snow have accumulated in some parts of Ft. Collins, per Denver7 photojournalist Major King. 6:31 a.m.: An Avalanche Watch is in effect for Steamboat, the Front Range, Vail & Summit, Grand Mesa, Aspen, and the Sawatch zones, the Colorado Avalanche Information Center says. 5:39 a.m.: Light to brief moderate snow will gradually spread southward into the southern portions of the I-25 Urban Corridor, including the Denver Metro area, thru 9 a.m., NWS Boulder says. 4:55 a.m.: Heavy bands of snow (>1" per hour) are snaking across the northern mountains and northern plains. A weather spotter reported 4" of snow just northeast of Fort Collins where the band was more persistent overnight, according to the NWS in Boulder. 4:30 a.m.: Here's the latest on the current snow totals expected as a band of snow moves out and another one moves in to most of Colorado. 1:34 a.m.: This is the latest radar image coming in from NWS Boulder showing heavier snow organizing from the mountains to Estes Park, Fort Collins and then to the Wyoming border.